During the week of May 25-31, 2015, under the direction of STUDIO fellow Lauren McCarthy, an enthusiastic group of participants with a range of skills, backgrounds, and styles gathered to work on all aspects of the free, open-source p5.js arts-engineering toolkit. Their work included new features, bug fixing, documentation, outreach, community, design, and internationalization. A list of the accomplishments of the workshop can be found here. Jason Alderman, Sepand Ansari, Tega Brain, Emily Chen, Andres Colubri, Luca Damasco, Guy de Bree, Christine de Carteret, Xy Feng, Sarah Groff-Palermo, Chris Hallberg, Val Head, Johanna Hedva, Kate Hollenbach, Jennifer Jacobs, Epic Jefferson, Sam Lavigne, Golan Levin, Cici Liu, Maya Man, Lauren McCarthy, David Newbury, Michelle Partogi, Paolo Pedercini, Luisa Pereira, Miles Peyton, Stephanie Pi, Caroline Record, Daniel Shiffman, Jason Sigal, Kevin Siwoff, and Charlotte Stiles. Alongside technical development, one of the main focuses of this conference was outreach, community, and diversity. 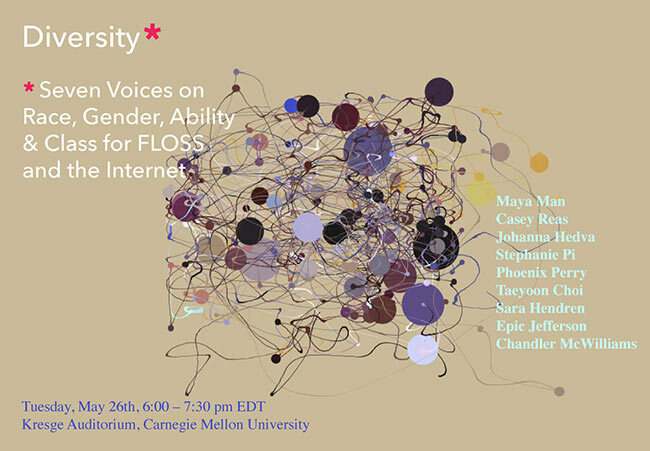 The conference began with a panel—Diversity: Seven Voices on Race, Gender, Ability & Class for FLOSS and the Internet. Organized by Johanna Hedva and Lauren McCarthy, the panel took place Tuesday, 25 May 2015 in Kresge Auditorium at Carnegie Mellon University. Speakers included Maya Man, Casey Reas, Johanna Hedva, Stephanie Pi, Phoenix Perry, Taeyoon Choi, Sara Hendren, Epic Jefferson, and Chandler McWilliams. Full transcripts of the panel by @OpenTranscripts can be found here. 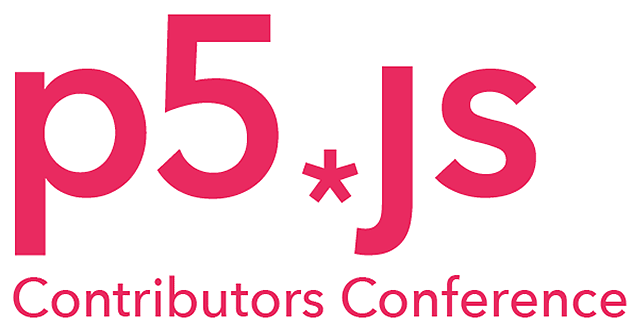 The p5.js Contributor Conference took place at the Frank-Ratchye STUDIO for Creative Inquiry at Carnegie Mellon University, an academic laboratory for atypical, anti-disciplinary, and inter-institutional research at the intersections of arts, science, technology, and culture. This event was made possible by a grant from the National Endowment for the Arts, and generous support from the NYU Interactive Telecommunications Program (ITP), the Processing Foundation, TheArtificial, Bocoup, Darius Kazemi, and Emergent Digital Practices | University of Denver. Additional thanks to Dan Shiffman and Linda Hager for supporting this initiative.